The soul of our beloved City is deeply rooted in a history that has evolved over thousands of years; rooted in a diverse people who have been here together every step of the way — for both good and for ill. It is a history that holds in its heart the stories of Native Americans — the Choctaw, Houma Nation, the Chitimacha. Of Hernando De Soto, Robert Cavelier, Sieur de La Salle, the Acadians, the Islenos, the enslaved people from Senegambia, Free People of Colorix, the Haitians, the Germans, both the empires of France and Spain. The Italians, the Irish, the Cubans, the south and central Americans, the Vietnamese and so many more. Read on. I missed this Megyn Kelly 'blackface' stupidity from Tuesday. The NBC face been on thin ice anyway, as Kelly's ratings have not been great. Her audience is 35% or more people -- largely women -- of color. She still hasn't recovered from her run-in with Jane Fonda, choosing to ask Fonda about plastic surgery rather than her activism, which was the scheduled topic. Fonda abruptly ended the interview. So Megyn Kelly, who already has a track record over objecting to black Santas, wonders out loud -- in the midst of this Trump crisis -- why whites can't wear blackface on Halloween. If the woman wanted to get her contract cancelled, she just delivered her own knock-out punch. Kelly’s off the air Thursday and everything is up in the air at NBC. Rumors are intense that her departure is in negotiations. Given the outrage among her own colleagues over her ‘blackface’ remarks, it’s difficult to understand how Megyn Kelly can survive. What was she thinking!!! Just last night I wrote a terse pushback over Instagram and Twitter outrage that Kendall Jenner was wearing frizzy curls in a photoshoot. Generally I feel that our culture has become way too politically correct. However, blackface??? Are you out of your mind Megyn Kelly? Because I refuse to buy the dumb blonde moniker, being one myself. The pendulum of Jane Fonda’s life swings wide right now. In Lyon, France to graciously accept the 10th Lumiere Lifetime Achievement Award, Fonda used her platform to first thank the french and then to speak on American politics. Speaking in French, which she masters fluently, having been married to late film maker Roger Vadim in the 1960s, she played on the surname of the inventors of the moving pictures, the Lumière Brothers. Lumière means light in French, and Fonda said her award was a gift of "amour et lumière", love and light. Preparing to leave France for Michigan, where Fonda is working with Taraji P. Henson to get out the vote efforts in the minority communities, the Oscar-winning actor currently featured in an HBO biopic ‘Jane Fonda In Five Acts’, summed up the concerns of so many progressives heading into the midterms on November 6. Projection artist and activist Robin Bell has turned his highly-effective visual projections on Supreme Court nominee Brett Kavanaugh, targeting his federal courthouse in DC with interchanging slogans: ‘Brett Kavanaugh Is A Sexual Predator’, ‘Brett Kavanaugh Lied Every Time He Testified’, ‘Brett Kavanaugh Must Withdraw’, and ‘#Believe Survivors’. Donald Trump’s Supreme Court nominee has been accused of a sexual assault by Christine Blasey Ford, allegations he has denied. The two will appear in front of the Senate Judicial Committee on Thursday. On Wednesday, another woman, Julie Swetnick, walked into the national spotlight, claiming that Kavanaugh had been present while she was gang raped in 1982. And on Wednesday evening, a fourth anonymous, but highly-detailed charge against Kavanaugh was revealed. 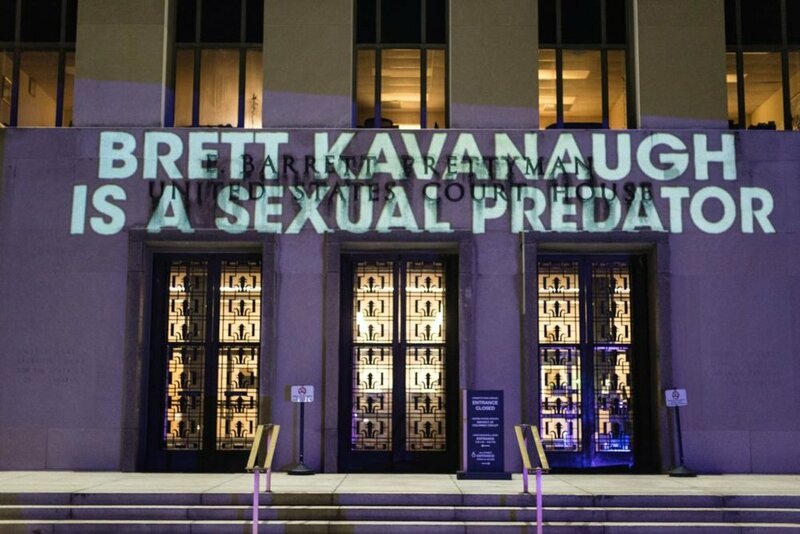 On Tuesday night, Bell pulled up in front of the E. Barrett Prettyman United States courthouse in a specially modified light projection van, beaming his message onto the facade of Kavanaugh’s workplace in an effort to highlight the allegations against the nominee and create a public shaming against the Supreme Court nominee. The guerrilla intervention was a collaboration with the women’s advocacy group Ultra Violet. Hunkering down in its support of former San Francisco 49ers quarterback Colin Kaepernick with derision from Trump and threats of a boycott, NIKE released a two-minute commercial narrated by him on Wednesday. NIKE also announced plans to run the ad on the NFL's first broadcast of the regular season. The ad, called “Dream Crazy,” features Mr. Kaepernick and other star athletes in the Nike stable, including Serena Williams and LeBron James. It implores viewers to dream big, using the inspiring stories of those stars and of everyday weekend warriors who overcame illness or disability to triumph athletically. The emphasis on disabled and physically-impaired athletes is given huge exposure in the uplighting, American moxie, 'Just Do It' 30th anniversary commercial. Greg Hughes, a spokesman for NBC Sports, confirmed to the New York Times that Nike had purchased airtime on Thursday’s N.F.L. game. The commercial is a shorter, 90-second version of this ad released digitally Wednesday. The league did not immediately respond to a request for comment. Nike is a major partner of the N.F.L.’s, providing the uniforms for all 32 teams and the clothing worn by everybody on an N.F.L. sideline. Read on. The poor polling in predicting Tallahassee Mayor Andrew Gillum's Florida Dem. gov primary win didn't take into consideration the Parkland students criss-crossing the state with a massive get out the vote effort among young people. Bernie only endorsed the former Hillary supporter in the last month. Meanwhile, Parkland students were on the move with voter registration and barely received any recognition for turning out the votes last week. Big media and pollsters struggle with anything new that doesn't fit their narrative. Reflecting an editorial shift, yesterday, BLM co-founder DeRay Mckesson was featured at Vanity Fair online, w/his now iconic Patagonia blue vest. (Not sure if article is in print). Now Vanity Fair takes an in-depth lookat Jaclyn Corin a key logistical brain behind the nationwide Parkland students movement. 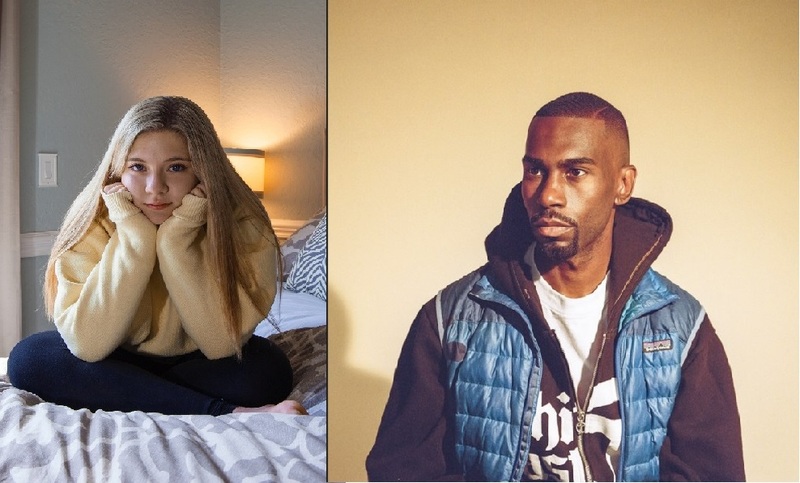 VF gives you 3 free articles a month, so take a read about this inspiring young people's movement across America and check out Deray's equally positive profile as he promotes his new book 'On the Other Side of Freedom: The Case for Hope'.